Sakai Community DocumentationSakai 19 User Guide (English) Tests and QuizzesHow do I view and modify the settings of an assessment? The settings of a test or quiz are complex, and offer many options. The modification of a setting in one section will not change settings in other sections. From the Tests & Quizzes Assessments screen, choose the Settings option in the drop-down menu for the quiz you would like to publish. Note: You can review and edit settings on a published assessment by selecting Settings in the drop-down menu for the assessment. It is not recommended to modify the settings of an assessment while testing is in progress, as it may cause loss of student submission data. Alternatively, you can access assessment settings from the edit assessment screen. If you are currently editing the Draft of the assessment, click the Settings link at the top of the assessment editing screen. 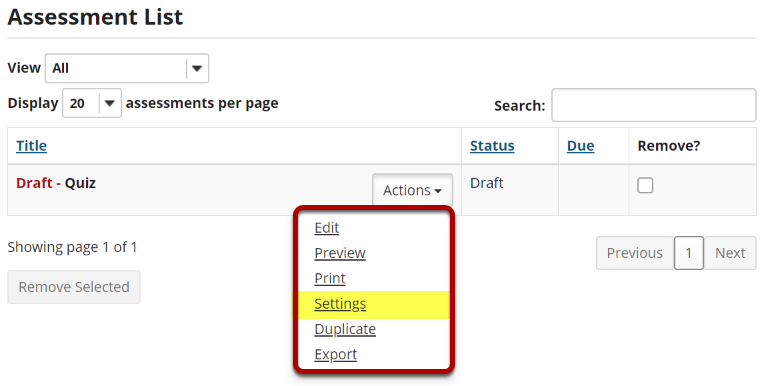 Click on the section title in the Settings screen to expand or collapse that section. Below is a summary of the options available to you in each of these sections, and a link to an article that describes the options in greater detail. In the About this Assessment section, you can edit the Title of your assessment, add a Description/Intro that displays before students begin taking the test, and require students to agree to honor pledge before beginning assessment. For more information on this section and its options, see How do I edit my assessment title or description? Indicate who should submit the assessment (Anonymous Users, Entire Site, or Selected Group(s)). Select how many times each student or site member is allowed to submit the assessment. Select the dates when the assessment is available and due, and until when to accept late submissions, if allowed. Set a time limit for the assessment, if desired. Choose whether to have in progress assessments automatically submitted, if the students have not already submitted the assessment. Restrict the assessment by a range of IP Addresses (to require students to submit the assessment within a specific building), or require a Password that students will have to type in at the start of the assessment to take it. You may also require the use of a lockdown browser. Create a message that students see upon submitting their assignment. For more information on this section and its options, see What are the Availability and Submissions options for an assessment? In the Exceptions to Time Limit and Delivery Date section, you can select users or groups within the site and specify a different availability window for the assessment as well as indicate the time limit allowed for that user/group. For more information on this section and its options, see How do I give specific students different date or time settings for an assessment? Choose whether graders see the students' names when grading. Select whether or not to send grades to the Gradebook tool. Choose which score is recorded, if a student is allowed to make more than one submission (also applies to allowing a retake). If and when students will receive feedback on the assessment, and what kinds of feedback you will make available to them (e.g. their answers, correct answers, assessment scores). For more information on this section and its options, see What are the Grading and Feedback options for an assessment? Layout and Appearance options control the overall look and feel of the test for students, such as how they navigate from one question to another, and how the assessment questions are numbered if the assessment has multiple parts. For more information on this section and its options, see How do I adjust the layout and appearance of an assessment? You can modify the settings, parts, and questions of any Draft assessment. When you publish an assessment, a copy is created and listed in the Assessment List. For the published copy, you can make changes to all the settings except Assessment Released To. To edit the settings, select Settings in the Action drop-down menu for that assessment. You cannot edit the questions in a published copy. Note: After you've published an assessment, if you modify the unpublished Draft version, you'll have to alter the assessment's Title before republishing it. When you publish it, you'll be creating another publication, NOT replacing the existing published copy. Note: It is not recommended to modify the settings of an assessment while testing is in progress, as it may cause loss of student submission data. Save Settings and publish the assessment. When the assessment settings are ready, and the questions are in place, click Save Settings and Publish to publish the assessment so that your students can take it. See the article How do I publish an assessment (i.e. test or quiz)? Alternatively, if you're not ready to publish the assessment, you can click Save to save your settings selections. Note: If you're modifying the settings of a published assessment, you'll only see the Save and Cancel buttons. Prev: How do I transfer ownership of a question pool? Next: How do I edit my assessment title or description?